This Orb: How Heavy & how Big? How Heavy & how Big? The next step is to figure out the size of your planet, and the strength of its gravity. This information is derived from your planet's mass, radius & density. With only 2 of these variables you can figure out gravity, and anything else relating to your planet's size. Given the same mass, the denser a planet is, the higher the gravity. Jupiter with over 300 times the mass of earth has a gravity of less than 3 times that of earth's (on the theoretical, unobserved surface of Jupiter) because it is very diffuse, made out of gas rather than iron and stone. Mass can be pretty much whatever you want, within certain bounds. Dole estimates (see Habitable Planets for Man, free PDF.) that a planet needs at least 0.4 Earth Masses to retain a human-breathable atmosphere. Depending on who you ask, 5, 10, or even 14 earth masses is the upper limit for a terrestrial planet. Beyond that it will retain so much atmosphere that it crosses over into gas giant territory. Radius can also be whatever you want, as long it doesn't force the other variables into something silly. Just be aware that radius has a strong effect on the surface area of your planet. If you double the radius, the surface area increases four times. Density is a little trickier. But here are the basics. Density is primarily determined by what a planet (or moon) is made out of. Gas, such as helium and hydrogen, tends to be least dense and then in increasing density are ice (water), rock, and iron. These are the main ingredients of the known planets. It is easy to find the densities for these materials at normal, surface of the earth conditions. But as the mass of a planet increases, so does the pressure inside, and thus the density of various materials. None of the of the world-building sites i've seen provide much guidance for the layman on what densities are reasonable. However i did find a recent scholarly article, Planetary Radii across Five Orders of Magnitude in Mass and Stellar Insolation, which while the calculations are over my head, i can use this handy chart. Color and grey added to enhance clarity. 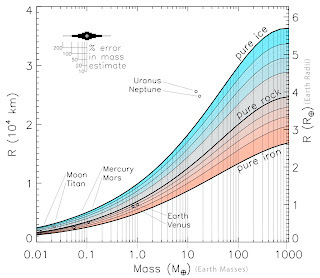 Mass (in M⊕) vs. radius (in km and R⊕) for planets composed for ice, rock, and iron. The topmost thick black curve is for pure “warm” water ice. (See text.) The middle thick curve is for pure rock (Mg2 SiO4). The bottommost thick curve is for pure iron (Fe). The three black thin curves between pure ice and pure rock, are from top to bottom, 75% ice/25% rock, 50/50, and 25/75... The gray dotted lines between rock and pure warm ice are the same pure ice and ice/rock curves, but for zero-temperature ice. The three black thin curves between pure rock and iron, are from top to bottom, 75% rock/25% iron, 50/50, and 25/75... At the upper left we show the horizontal extent of mass error bars, for any given mass, from 10 to 200%. I should mention that for human habitability you probably want at least some iron in your planet. Earth's metal inner core is thought to produce our magnetic field, which besides making compasses useful, wards off harmful cosmic radiation. Also, rotating planets are never exactly round. The speed of rotation tends to create a bulge at the equator. This is not really noticeable in earth-like speeds of rotation, but if you want to play around with a planet that has increasingly strong gravity toward the poles, spin your planet really fast, like Hal Clement's classic, Mesklin. B: If you don't like spreadsheets, go to this Planet Designer website, enter mass & density and have the resulting diameter, surface area, and so forth calculated for you. C: Read about the formulas here and do the math for yourself. It also provides formulas to calculate the difference between polar and equatorial gravity, if you care, though generally the differences will be negligible. Continually curious. Elsewhere i go by the pseudonyms "eleazar" or "eleazzaar"
So what range of Gravity is Habitable for Humans?